Tip: When cooking this type of rice stir only once. Over stirring can break the rice and make it heavy and sticky. Vegetarian Option: Replace the chicken with Quorn and don’t use the chorizo. You can also Sweet potato as an alternative. This dish is typical of what you would see in the truly wonderful Hawkers markets of Singapore. I remember first seeing these little clay cauldrons of Oriental flavour popping and bubbling on the open flames. It’s funny as it reminded me of the Giants Causeway in the way they were staggered in height, like stepping stones. This is done to control the cooking heat – Gordon McDermott. Preheat the oven to 180 degree Celsius, gas mark 4. Combine all the marinade ingredients in a bowl and add the chicken and mushrooms. Toss well to mix everything together and make sure the chicken is well coated. Cover and place in the fridge for at least 2 hours to absorb the flavours. 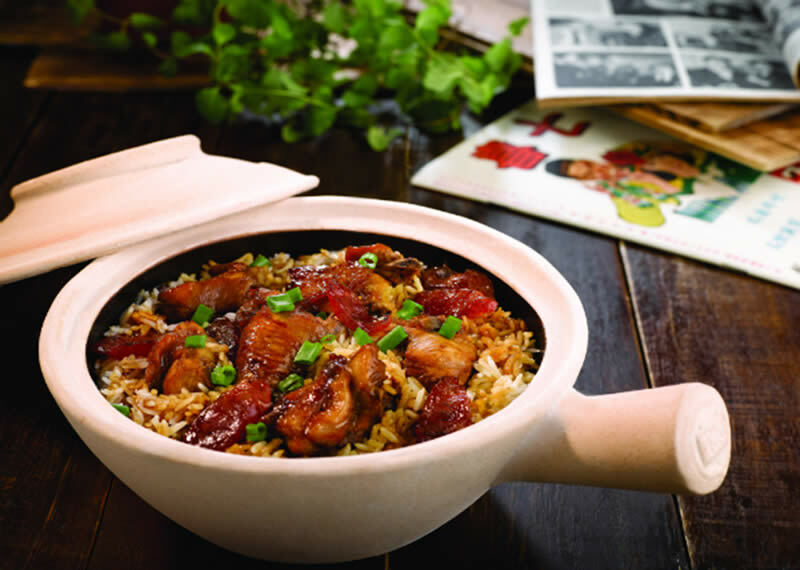 Place the rice in a heavy based casserole dish (in Singapore, a Clay Pot over flames would be used) with a lid and add the chicken stock (and master stock, if using). Then cover and cook in the oven for 15min. Remove the lid and spread the marinated chicken and mushrooms, chorizo and ginger over the rice. Cover and transfer back to the oven. Cook for a further 20min until the rice and chicken are cooked through. Remove from the oven and taste for seasoning. Scatter over the scallions, chili and coriander and serve.